In a global environment that continually grows more complex, it’s important now more than ever that young people are educated and equipped with the proper skills to take on life’s challenges. In the U.S., we often think of these “proper skills” as limited to Science, Technology, Engineering, and Mathematics, or STEM. 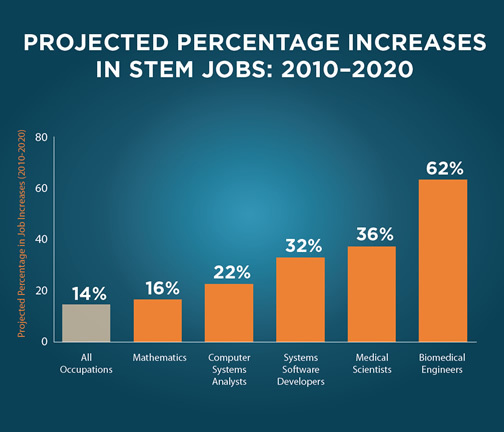 All of these subjects are important; in the coming years, demand for scientists, software developers, engineers, and mathematicians are all expected to continue to rise beyond that of non-STEM occupations (U.S. Department of Education). But in a STEM curriculum, a very important component of learning is missing--the letter “A” for Art. For young learners, art is a part of growth and development that is of paramount importance. Just like STEM, art provides students with the skills necessary for lasting academic, personal, and professional success. According to Americans for the Arts, students engaged in the arts are four times more likely to be recognized for academic achievement. If they take four years of art in high school, they’re also more likely to score higher on the SAT than students who take only one-half year or less. Furthermore, according to a study published by the American Psychological Association, children who engaged in simple, art-based interventions displayed better divergent thinking and creativity after the intervention than children who did not have an art-based intervention. The study evidences the measurable boosts of creativity achieved by engaging in artistic learning. Great news, especially considering that 72 percent of business leaders say that creativity is the number one skill they seek when hiring. ARCK’s founder and executive director, Sara Demeter, has even witnessed creativity blossom first-hand. During a weeklong art-healing workshop, Sara worked with Syrian refugee children. At the start of the program, the children expressed their sadness on paper with images like tanks, fires, and guns. But as the week progressed and they got to do activities like building their own cities and learning about physics through simple experiments, they were able to portray beautiful stories like olive groves and peaceful homes. They finished the workshop with hope, conveying their new dreams of being scientists, doctors, teachers, architects, and more. One little girl even said she’d like to open up an art nonprofit of her own. For these reasons and many others, STEAM education is on the rise. Originally coined and championed by the Rhode Island School of Design (RISD), the STEAM movement moves to incorporate Art and Design into the current national agenda of STEM education. The STEM to STEAM movement has its origins in a 2012 club fair at RISD, where leaders of the new club pledged to foster creative, innovative thinking at the intersection of science and art. While interning at ARCK, I had the opportunity to observe STEAM in action. Understanding that art has the capacity to foster creativity, confidence, and critical thinking, the ARCK curriculum aims to engage students in STEM with art as the mechanism. In doing this, like those over at RISD, we aim to combine the logical mind with the imaginative mind, ultimately making for individuals who are truly creative thinkers and inventors. For example, one of the projects in our Social Justice module examines oil spills and pollution through abstract painting. We begin this lesson by explaining oil spills, the harm they cause to the ocean, and giving examples like the 2010 Deepwater Horizon spill in the Gulf of Mexico. 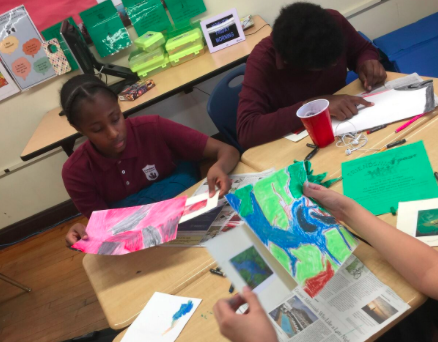 Observing aerial shots of such spills, students understand the effects of pollution on the environment, as well as visualize the connection and the opportunity to portray similar scenes through painting. With this, students paint their own depiction of oil spills, understanding the catastrophe through their very own artistic rendition. Not only that, students in ARCK classrooms also learn to utilize their art as calls to action. 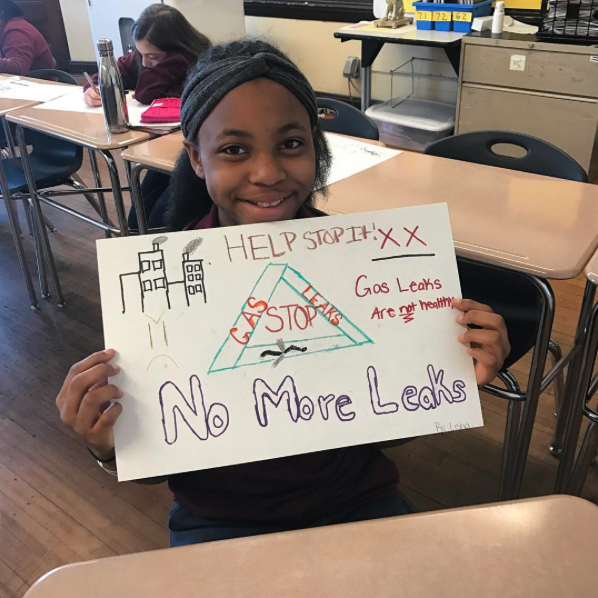 As an intern in a classroom of 5th and 6th graders at Gardner Pilot Academy, I got to see students excited to bring attention to the Boston area’s gas leak problem. With the help of Mothers Out Front, a Massachusetts nonprofit that raises awareness about environmental issues, we learned that many of Boston’s aging gas pipes are corroding and leaking, and that everyday people are the ones who pay for it. Not to mention, gas leaks are dangerous for both the environment and for human beings. After hearing of this, students were nothing less than animated--extremely excited to start the project. And what was the project? 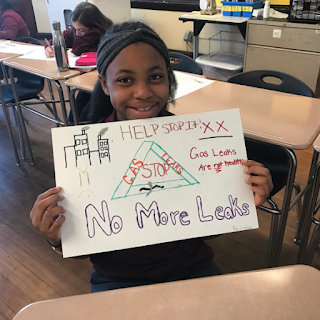 Well, creating posters to protest gas leaks, of course! At the end of every day at ARCK, though the main lesson of each project varies, one primary idea is consistent. Each of our lessons involve the use of both logic and imagination. From environmental science to geometry, painting to printmaking, ARCK’s goal is to utilize a STEAM curriculum to cultivate as many as possible creative, confident, and critically-thinking young people.